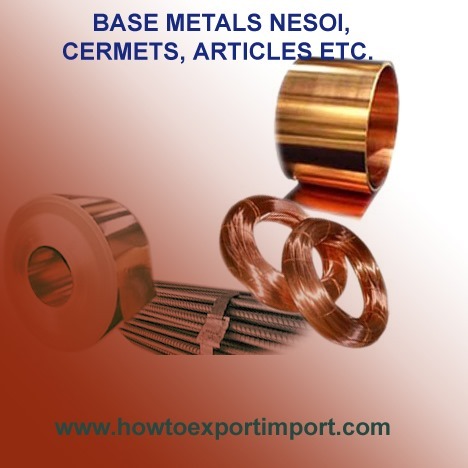 In this article, the Harmonized System codes (Harmonized Tariff System- HTS) for BASE METALS NESOI, CERMETS, ARTICLES ETC are mentioned which help you in exporting and importing of BASE METALS NESOI, CERMETS, ARTICLES ETC. These codes help exporters and importer all over world to know product classification code named differently in each country like Schedule B, ITC, HS, HTS, Tariff Code etc. Posts about overseas trade online. Shambhu Kumar : On 08 July 2015 i want start export business but i have no idea for this business. so i need your help. ram shanker: On 28 April 2016 i am exporting antimony metal chapter heading 81101000. we have applied the application for MIES reward. But DGFt no except my application because Description of goods Unwrought Atnimony: powder MIES reward scheme (81101000). I am sure the description of goods . Antimony Metal same Unwrouht Antimony. Please clear my question. Documentation to Import Base Metals, Cermet's, Articles etc..